Ukraine is one of the countries, which over the last 10 years has gained the leading position among the areas where technological entrepreneurship develops pretty fast. Numerous IT and other companies fall back upon outsourcing competent and professional workers to their local or foreign offices. That is the reason why the tendency of hiring software engineers in Ukraine is so widespread. Here, we present you 13 the most outstanding reasons why this particular country is the best destination when it comes to offshore software development and why this solution will be the most workable for your business. The most significant asset of the Ukrainian IT market is the pool of tech talents. According to recent research, there are over 185.000 developers in Ukraine, which is the second largest number after Poland in the CEE region. Another research forecasts that by 2025, Ukraine will have 242.000 IT specialists or more than twice the current number. That's why numerous European countries turn to Ukrainian tech savvies when it concerns IT. Most of them live in the biggest Ukrainian tech hubs such as Kyiv, Lviv, and Kharkiv. The educational system of the country provides high tech standards. There exist 402+ colleges, universities, and academies producing up to 130.000 graduates annually. Referring to statistics, more than 74% of Ukrainians enter higher education in programming, 9% of Ukrainians - in economics and management, and 11% - other areas; 4% of Ukrainian students go on to secondary education and 3% of Ukrainians -secondary education with specialization. Kharkiv Radio Electronics National University. Ivan Franko Lviv National University. Nowadays, classic or university education does not measure up to exacting outsourcing industry standards. 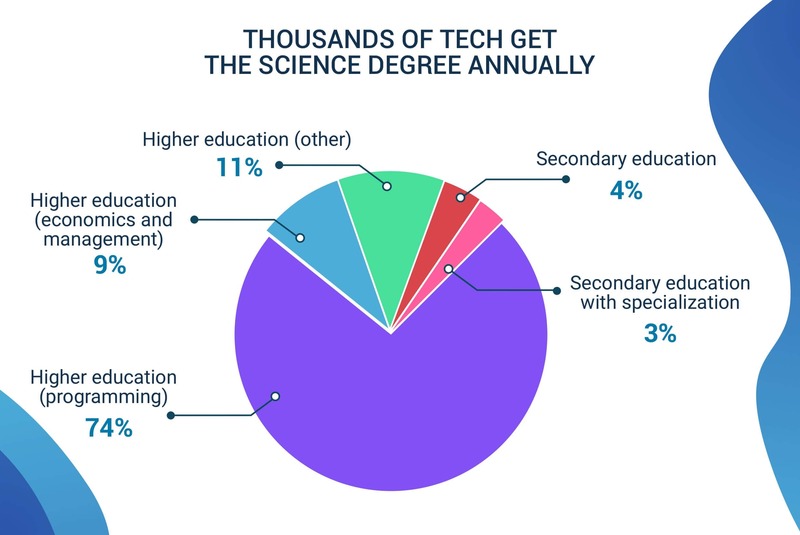 That’s why big IT companies started to launch new educational programs and set up their own IT training centers where they can provide required knowledge or re-train specialists to close a gap between IT sector requirements and university education. 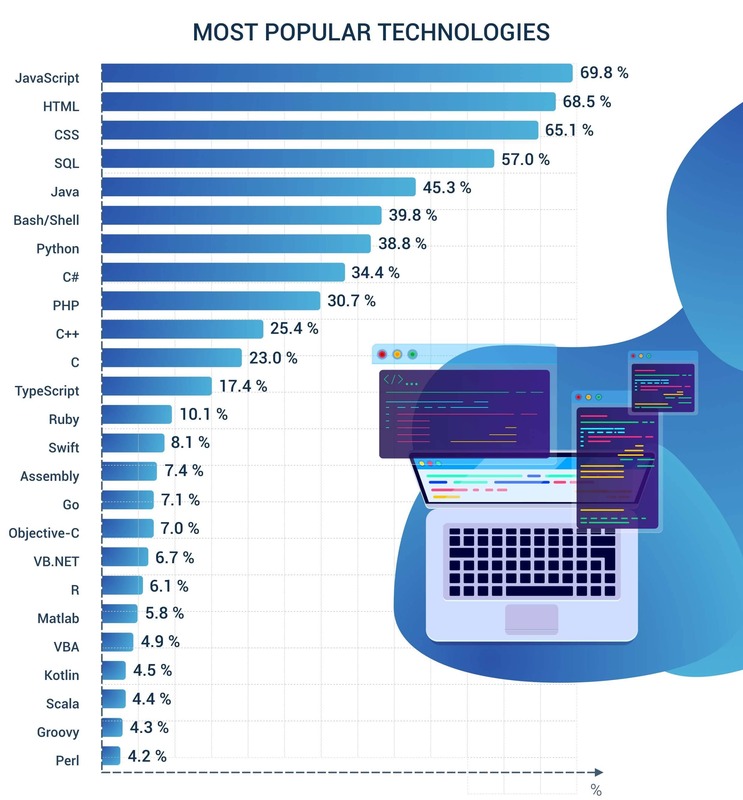 According to the recent statistics, up to 44.000 students have graduated IT courses that helped to learn or improve skills of Ukrainian software developers increasing the number of qualified IT tech savvies. iForum, offline conference held in Kyiv, covering a wide range of topics, such as Internet Business & Startups, Advertising & Promotion, Internet Technologies, EdTech of the Future & Innovations, CRM & Loyalty, etc. Agile Eastern Europe Conference, a two-day event aimed to promote Agile software development and Scrum project management. IDCEE that unites the world leading IT entrepreneurs, investors, C-level executives, top managers and developers. GDG DevFest Ukraine, a two-day event that brings together developers and people who shape the future of Android, Web and Cloud technologies. IT Arena that covers Business, Product, and Technology topics, and also includes the startup competition and numerous meet-ups. Mentioned above communities allow Ukrainian developers to learn the field leaders' practice and meet their colleagues. Ukraine is ahead of most European countries for 1 hour only. That is why, it is an excellent location for numerous development teams for nearshoring, cause communication and workflow between such geographically adjacent areas are much smoother. American companies also can regard the country as a convenient offshore choice, since the timezones are 7 hours apart. It means that software developers in Ukraine will complete all the tasks several hours ahead of the others. Moreover, today there is a vast number of domestic and international airlines offering regular and direct flights from Ukraine to the fastest growing tech hubs - Berlin, London, Stockholm, Copenhagen, Paris and others. For instance, Ukraine's capital Kyiv provides at least 3 direct flights per day to Berlin at the cost of €60. Also, it is possible to fly directly to New York or Washington from Kyiv starting from $500. Thus, Ukrainian software engineers can discuss potential or ongoing issues with the clients face to face by scheduling trips regularly. As software development in Ukraine gains momentum, solid English skills became a must have for all IT employees. 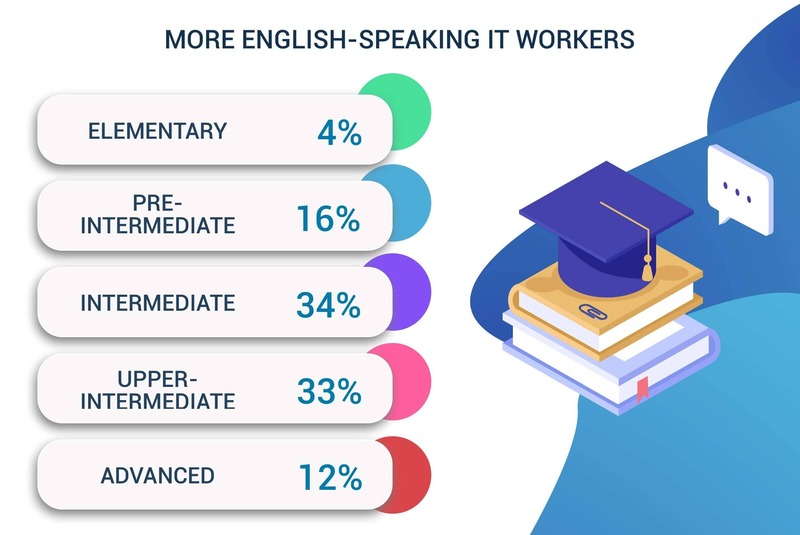 More than 80% of Ukrainian software developers both speak and write English either at an intermediate or a higher level. There are usually held language courses for employees, in order the communication and co-work with foreign partners pass top-level. The working attitude of Ukrainian IT industries and one of the Western businesses is very similar. The local professionals do not only complete tasks in hand, but also get engaged in the projects and plans. Being interested in common success, there is no need to involve any third-body, direct communication between the companies will lead to faster and easier cooperation. Ukraine provides only a few holidays requiring paid vacation days within the whole year, which makes the working process even more efficient. There are up to 10 public holidays, which are universally set and mentioned as day offs. Currently, Ukraine is laying the groundwork for a more favorable business environment due to harmonizing its international policies. According to the recent report, Ukraine’s IT exports reached a new record of 4.5 billion U.S. dollars in 2018 and is projected to increase to 5.4 billion U.S. dollars in 2020, with the forecast for 2025 currently standing at 8.4 billion U.S. dollars. These figures make Ukraine a perfect location to find an ideal tech partner with top developers that can deliver a wide range of software solution and thrive their business. When it comes to recruiting software developers, Ukrainian professionals match perfectly. Comparing to the neighboring areas (Czech Republic, Poland, and Belarus), the country provides more competent tech employees, along with viable salary range. The status gets improved when viewing the list of countries with the best business activity, where Ukraine takes the 30th position. Information technologies are growing rapidly nowadays, so IT companies do their best to keep up with it and use cutting-edge solutions to get noticed in the market. The world market leaders, such as Magento, Wargaming, Siemens, Boeing, ABBYY, Samsung Electronics, and others have located their R&D centers in Ukraine. These are only several examples, as the number of such global companies reaches up to 100+. They have settled in the country due to its convenient geographical location and the time differences with the main European cities that are not critical. Mentioned above big names have started in Ukraine. Their success stories cannot but inspire a strong sense of entrepreneurship in the local tech community, as well as lead to an increase in international investor interest in Ukraine. Final words: Are you still hesitating to hire Ukrainian developers? Gaining more and more experience and skills, Ukrainian IT workers become highly sought internationally. Here, you see several sound reasons, why software developers from this very country can be your best employees or a reliable tech partner. This gives you an opportunity to get to know the specialists better, notice their outstanding features and estimate the possibilities. Responsible attitude, qualified knowledge and constant development of experience will lead to a smooth working process with desired results. We, at DDI Development, can turn any client’s idea into a real software solution.